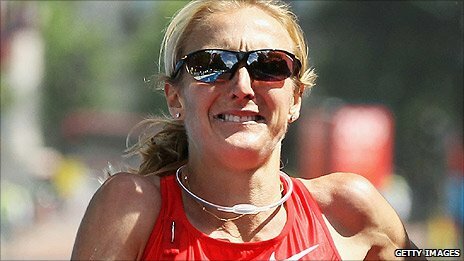 Paula Radcliffe finished third in the Bupa London 10,000 on her comeback from an 18-month absence. Jo Pavey stole the show as she finished ahead of Gemma Steel in an time of 32 minutes 23 seconds with Radcliffe, 37, almost a minute behind. "For me it was a bit of a disaster," said a visibly upset Radcliffe, who last ran in the New York marathon in November 2009. Mo Farah defended his title in the men's race, winning in a time of 29:15. Marathon world record-holder Radcliffe, who has been recovering from injuries and giving birth to her second child in September 2010, added: "We set off and I didn't feel great and couldn't stay with Jo. "I could see her so I was thinking 'don't panic, just hold it, things will warm up a little bit', but then at 4km I just started to go backwards. "I think my fourth to fifth kilometre was terrible and then I stopped looking so I don't know what the time was after that, but it wasn't good. "I've got a tear in one of the discs in my back which has meant I can't go on the track, but I thought I was going to be fine on the road. "It's sciatic pain and I just lose power in my legs. "I've beginning getting treatment on it and I thought I'd be okay. It wasn't particular sore in the race, it just felt like I didn't have any power out there." A tearful Radcliffe added on BBC Radio 5 Live: "I hoping this isn't a big setback ahead of the 2012 Olympics. "If I'm still feeling like this in two months then I'll be panicking, but if it is just a month then hopefully I will be alright. "But it is not nice and I'm certainly not proud of the way I ran today. At this stage all I can do is just try my best. "I'm not a magician, I can't change things, as much I want to, I just want to try and stretch my career for as long as possible." Pavey admitted afterwards at being nervous ahead of the race but was pleased to have come through it. The Brit also backed compatriot Radcliffe to return to her best sooner rather than later. "I was pleased, I really enjoyed it," Pavey told BBC Sport. "It's nice to win the event. I know myself how hard it is to come back from having a baby. We all know how great Paula is and I'm sure she'll be back to her best very soon." For double European champion Farah, it was the latest in a series of ever-growing list of high-profile victories this year, having won the New York Half Marathon, the European indoor 3000m title, the Bupa Great Edinburgh Cross, and the 5000m at the Aviva Birmingham Indoor Grand Prix. "The race went really well," Farah told BBC Sport. "I wanted to come here and defend my title. I've won in for the past two years so this makes it three times. "The crowd made such a big difference. I came back from America yesterday so my main aim was just to win the race rather than run a fast time." Meanwhile, athletes have given the marathon route for the 2012 Olympics through the historic heart of London a thumbs-up on Monday after a dawn test-run. Thirty-nine runners hit the streets of London at 0600 BST to check the 26-mile [42-kilometre] route, as the build-up for the Games gathers pace. The route starts and finishes on The Mall, a wide boulevard leading up to Buckingham Palace, and takes in other landmarks including St Paul's Cathedral and Trafalgar Square. "It's designed to showcase the city and it does that well. It is a very cleverly selected route and will be popular with viewers and runners alike," said runner Chris Finill, who was the first of the athletes to cross the line. Debbie Jevans, the London 2012 Organising Committee's director of sport, added: "We were testing the technology and timing all the way round and it worked very well. "What was run today will pretty much be the course, because the feedback from the athletes has been so positive." Pavey added: "It's great they've got a course that will showcase the city." The athletes were from running clubs and had been invited by Olympics organisers to take part in the test. The course will be used for the marathon, race walk and road cycling at the Games.